Above New skin care products from M. Steves, Previse and Tata Harper (see sidebar). When you hit 40, or in some places, 30 (think Los Angeles, Seoul and Rio de Janeiro), there is a lot of talk about “ageing gracefully”, even though the reality is people have gone about it through a variety of means. At times, even with a good doctor in your employ, and a procedure generally being successful in removing wrinkles, acne scars and other unplanned gaps and sags can go a little too far. We’ve seen it with A-list women sporting slightly too-full lips and cat eyes, and ageing rock stars bearing a passing resemblance to Alvin or one of the other chipmunks. When it comes to those of us who dabbled, after one improper Botox injection, we long for the day we can feel our face again. 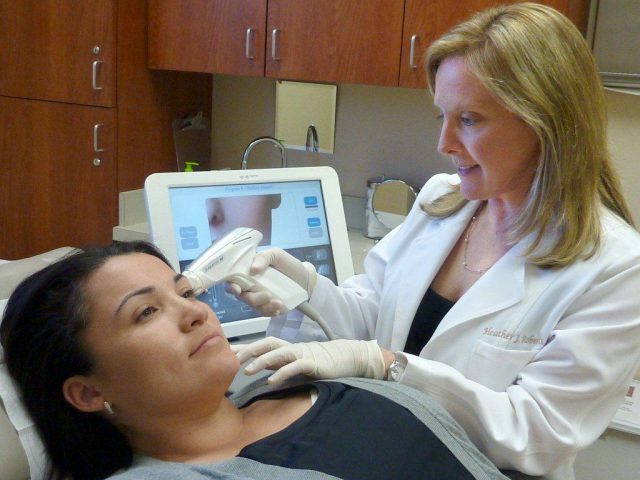 Starting with the microdermabrasion trend a few years ago, there’s an evolving focus both within the medical establishment and consumers to put off the knife and the needle as long as possible. Cleaning devices like the Clarasonic Brush and NuSkin (a fun and user-friendly invention given to me at a recent GBK Event) bring the med–spa experience home and within most average women’s price ranges. However, even when we buy the best products and gadgets out there, there comes a point when we have to consider a between step. For me, it was a class reunion combined with my new year’s resolution that 2012 would be the year I would at last find the “real” Mr Right after kissing so many of LA’s finest frogs, snakes and lizards. Times like this, especially in over-programmed schedules, is where laser treatments like Syneron come in. I was invited to come in to see what a difference three short treatments could make during a summer where fake tans and Pucci prints were in full flower. Though my skin was already in pretty good shape for a woman of 43 (thanks to excellent genes on my mother’s side, access to great skin care, slavish use of sunscreen and a Clarisonic), there is always room for improvement. Just ask the glowing-yet-sensible west Los Angeles-based Dr Heather Roberts, a board-certified dermatologist and facial rejuvenation expert. She one me over right away given the fact that she ascribes to the notion that opting for non-invasive treatments may be as good or a better a first step for some women than injectables like Botox. Dr Roberts, who was one of the first practitioners in the US to adopt the Syneron Sublative laser system (sublativeskin.com), was very specific in helping me manage my expectations for the results. Unlike other laser treatments that fade age spots, this treatment was more for improving overall firmness and quality in the skin by stimulating collagen productions with the patented device consisting of several finely arranged laser beams. During the treatment, Dr Roberts noted that each session is constituted of 200 “clicks” with each computerized head at the end of the device comprised of 100 clicks. The clicks feel like dozens of tiny pin pricks, but the pain varies by what part of the face or neck is being addressed. In more technical terms, the FDA-approved Sublative treatment is defined by a proprietary fractionated bipolar radio frequency technology that places heat energy in the upper layers of the dermis allowing for a significant increase in collagen and elastin production for a brighter and smoother complexion. This Sublative breakthrough technology offers a high dermal impact with low epidermal disruption. Other things going for the technology is its affordability, accessibility, little treatment time to no and minimal downtime compared to more invasive treatments. On my first visit, I was warned about the sensations—painful, and hot, but short—somewhat like a rubber band hitting my face numerous times. My reality, however, was that the numbing process and the 12-hour after-period were more painful than the actual procedure. The next morning, the worst of the sunburn-like pain had subsided, and I was back to my normal routine, albeit with CeraVe Foaming Cleanser and Neutrogena sunscreen replacing my usual mix of beauty luxuries and drugstore finds. It also helped to have an ice cold spray bottle of Avene Mineral Spring water on hand—especially when entering a hot car. Dr Roberts did warn there would be small chequerboard-like markings on my face, but thankfully, I was able to cover these with Coola mineral sunscreen, a favourite brand that has titanium and zinc dioxide recommended by the doctor and her team. As time wore on, I noticed the make-up I used in my regular routine (Stila’s One Step Illuminate bronzing primer, US$36, followed by Coola tinted moisturizer, US$30, or Clarins’ foundation for evening) went on more evenly, lasted longer and covered my age spots better. While the age spots did not disappear, they did get lighter. I even noticed some improvement in my photos—nothing dramatic, but I definitely looked more awake and fresh. At the start of my second procedure, six weeks later (a month between visits is recommended), the physical sensation of the numbing was less intense. Although Dr Roberts decided to stimulate more collagen and uptick the intensity of the Syneron device slightly, and my face did smart a bit in the immediate aftermath, I noticed that it felt a lot better within two hours of the treatment, and I felt comfortable enough at the end of the day to do a low-intensity workout in my apartment’s gym. Dr Roberts did notice that, from her vantage point, my wrinkles and pores were smaller. She also noted she tried the Syneron on herself, and was liking what she saw in her mirror as well as in her patients. A bigger challenge facing me in the days following the second treatment was keeping my face and neck out of the sun, with a planned weekender trip to Redondo Beach to get out of the San Fernando Valley, as record heat plaguing the rest of the USA had unfortunately caught up with us. Dr Roberts’ team made sure I had plenty of Neutrogena sunscreen for the road. With my 25th high school reunion in October, I planned my third and final trip to Dr Robert’s office on September 18. With proper precautions taken, and hats worn, my face quickly returned to normal, and though subtle, I could notice continued improvements on my general appearance. The third and final treatment, however, surprised me—my skin was more sensitive during both the treatment and the recovery time. When I asked Dr Roberts about this, she attributed the spike in pain to the timing of my third treatment, just after my period. As this was the last treatment, we also decided to go a little deeper into areas where the lines or pores were a little more pronounced. Though the redness in my face was a little more pronounced after the third session (it looked and felt like a full-on sunburn), Dr Roberts noted my pores were smaller and my age spots had faded—not disappeared, but make-up more readily covers them. She added that I would continue to see improvement over the next six months, and suggested I come back for more photos to see the quantifiable results over time. In just a matter of days, when the pain, discoloration and little “grids” faded, smooth skin was left behind. Dr Roberts, like many other conscientious dermatologists, will tell their patients that the excellence and effectiveness of their work is partially contingent on how well a patient maintains her skin once everything is thoroughly healed. While we may have a skin care regime that works for us one moment, it’s always good to consider adding or switching out products, based on the changing needs of your skin. Though it is always smart to talk to your dermatologist about a new product on the market and its ingredients, or try samples before investing, there are new lines that are quite intriguing based on what they have in their formulas—and what they don’t have. Proprietary ingredient: Argan oil may be the buzz right now, but line creator Mally Steves Chakola argues the case for rose hip seed oil (RHSO) in creating a simple, five product line that is customizable based on how and when different individuals use the products. Like many other inventions, it came about as a result of a happy accident where she purchased rose hip oil instead of rose oil at her local health food store, but decided to mix it with her moisturizer to see what would happen. At the LA launch, Chakola (an attorney by trade) swears by RHSO, a power-packed oil rich in essential fatty acids, Omegas 3, 6 and 9, and potent antioxidants and antinflammatories. Sourced from the seeds of rose bushes native to the Andes Mountains, rose hip seed oil is said to improve the appearance of fine lines and wrinkles, scars, sun damage and skin tone, while nourishing the skin. In other words, depending on how you use it, it could be the cure to what ails your skin. 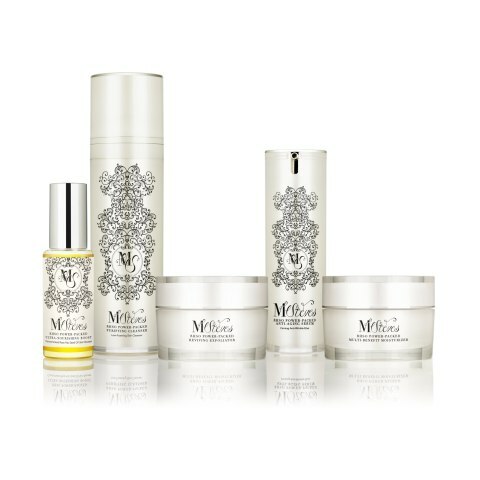 Proprietary approach: MDSolarSciences, a physician-driven primary skin cancer prevention company, introduced their prolific but focused range of products to beauty editors at a Diamond Girl Media suite staged during LA Fashion Week’s festivities. Though not related to any of the splashy events, those discovering the products at the suite were impressed with the line, which is eco-friendly, PABA-free, safe for use on children and are non-irritating even for those with acne and rosacea-prone skin. We were particularly impressed with their SPF 30 Mineral Screen Tinted Gel (US$23·95) which, like today’s popular BB creams, goes on nearly invisible but “colours up” to blend in to one’s natural skin tone, and with a silky finish. 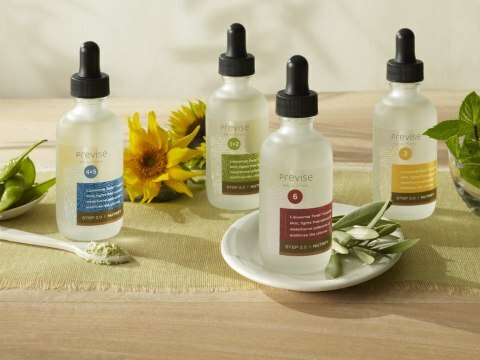 Proprietary approach: A seeming godsend for organics enthusiasts and people with sensitive skin, this collection (showcased at WOW Creation’s Emmy Suite) brings the best of Europe and America, produced from organic ingredients in Vermont. Each product contain at least 6 and up to 29 active ingredients each. The brand also boasts it is the only clinical grade line that’s 100 per cent all-natural, synthetic chemical free and non-toxic. Most active ingredients, in fact, are things you can pronounce—lavender, rose, jasmine, orange blossom, safflower, sandalwood, date palm and bergamot among them. Proprietary approach: Featured at this year’s Coco Eco Magazine Emmy Gifting Suite, the Previse “prescription” is based on the outcome of a consultation where you are ultimately matched to one of four three-step sets based on your skin pigment or melanin, your geographic location, past skin care history, family history, personal sun exposure habits and other health issues. Previse Medical Advisor and dermatologists Dr Ellen Marmur points out, ‘Melanin is our body's natural shield to protect our DNA.’ Utilizing a proprietary algorithm, the consultation aspect of the web site evaluates your genetics and tendency to develop skin problems based on your family history and habits. Proprietary approach: The customizable line, that promises what department store or drug store foundations can’t, was devised by Scott Hersh, an eight-time Emmy Award-nominated make-up artist whose goal with the line is to make a professional grade line that is accessible to the average woman and takes the guess work out of picking the right shade. Proprietary approach: Lifeline Skin Care was a serendipitous discovery Dr Elena Revazova made during her search for a cure for diabetes, which claimed the life of her daughter. After emigrating to the US and becoming a volunteer research scientist to help find a cure, Dr Revazova’s subsequent work led to the creation of the first non-embryonic human stem cells that can proliferate and live almost indefinitely. Though stem-cell-based applications are making news in the hopes of leading to cures for various ailments, what makes Lifeline’s formula special is that it is the only skin care product on the market based on the non-embryonic stem cells technology which stimulates the skin’s own abilities to repair itself. Even more beautiful is the fact that purchases of Lifeline Skin Care products help finance further research into finding cures and treatments for diabetes, Parkinson’s Disease, liver disease and blindness. Proprietary approach: Skin Salvation’s active ingredients include such familiar things as Coenzyme Q10 (an antioxidant and natural skin energizer that tones and firms by supporting the skin’s collagen and elastin networks), a mix of liposomal vitamins A, C and E, which comprehensive antioxidant protection, and green tea extract (an antiinflammatory with potent antioxidant properties and a calming effect on the skin). Creator (and Beverly Hills-based dermatologist to Denise Richards, Kim Kardashian, and Jennifer Lopez) Dr Harold Lancer’s magic bullet that makes all of these good things work is his CRT Oxygen Technology, which oxygenates the skin to make these ingredients work more effectively. The Overnight Rescue Relief brings age-defying properties with its mix of collagen, placental serum isolates and shea butter activated with his CRT Oxygen technology. Elyse Glickman is US west coast editor of Lucire. Elva Zevallos contributed to this story.